The Sim*Suture Module will help the learner practice skills of simple interrupted and running suture, instrument tying, vertical mattress sutures, and running subcuticular sutures. 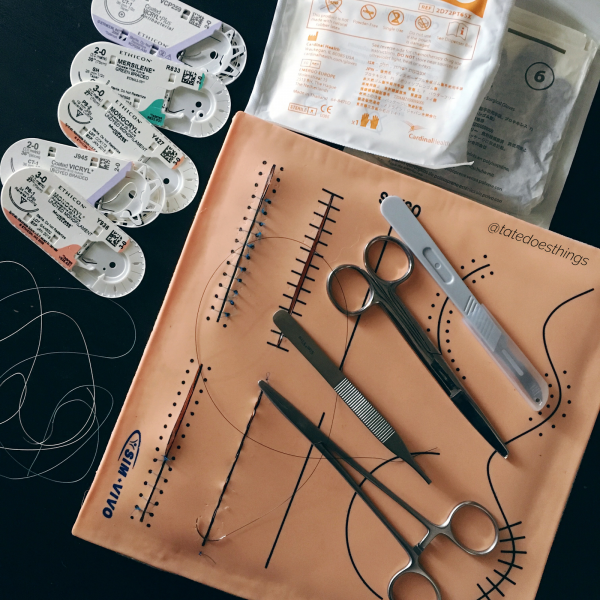 As with all our modules, practice outside the simulation lab is encouraged with the availability of all necessary supplies: suture pad (with printed lines to guide placement of sutures), surgical instruments, and suture material. The exercise book provides the opportunity for the learner to practice in any convenient locale. Enough suture material is provided to place over 250 single needle passes. The time required for this module is about 4-6 hours. Curriculum offers opportunity for formal objective skills assessment (OSATS) when the module is completed. Complimentary learning videos for this module are provided on this web site.